University Advancement at OSU has just introduced new banners around campus that help illustrate stories from the mentor program — “recognizing the relationships that change lives”. While working for Equilibrio Azul, Robbie spent every morning monitoring shark catches in the local fish market, as well as weekly beach surveys monitoring the local sea turtle nesting habits. Upon his return to Corvallis, Robbie went back to work for Dr. Hixon, this time with the intent of traveling to the Bahamas with the Hixon lab for the summer fieldwork season. 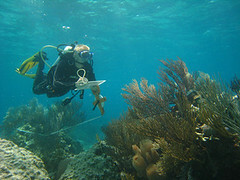 Robbie secured two research grants to pay his own way to the Bahamas, where he spent three months working as a SCUBA research assistant. He also used his grants to perform his own study on the Oregon coast with the help of an Oregon Sea Grant undergraduate research fellowship. 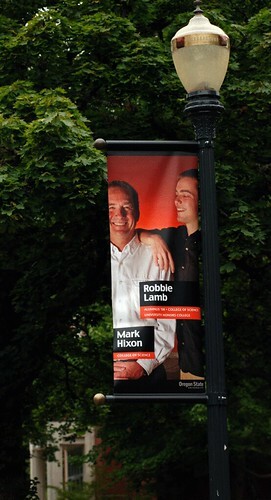 Robbie graduates from OSU in September with honors degrees in biology and international studies. He will then move back to Ecuador to start work on a Fulbright fellowship, working to improve the sustainability of small-scale Ecuadorian fisheries. This entry was posted on August 11, 2008 at 10:31 am	and is filed under Zoology. You can follow any responses to this entry through the RSS 2.0 feed. Responses are currently closed, but you can trackback from your own site.